Saturday's early morning rain may have cooled down North Texas but it will delay traffic changes at two places in Denton County. 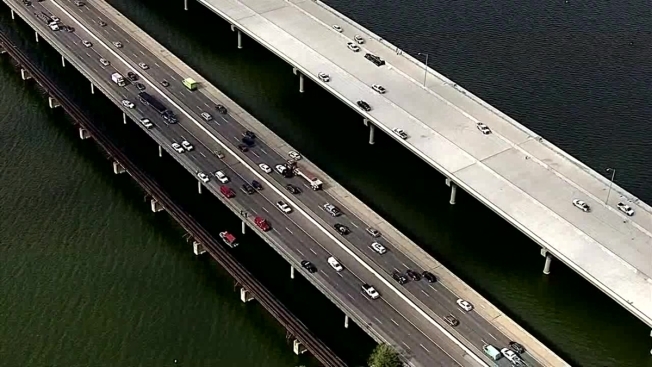 According to the 35Express project, work to shift southbound traffic onto the new Lewisville Lake bridge is now on hold. Crews will return to the site on Saturday night weather permitting. Drivers can expect various lanes closures along southbound I-35E between Turbeville Road and FM 407 on Saturday night. 35Express project said rain delayed the reopening of the I-35E frontage road between Swisher Road and Oak Drive until 10:00 a.m. on Saturday. Both the Lewisville Lake and Hickory Creek projects are part of a $1.4 billion expansion of I-35E between U.S. Highway 380 in Denton County and I-635 LBJ Freeway in North Dallas.